Business for Peace devised the term businessworthy as a valuation to describe value-driven business behaviour. 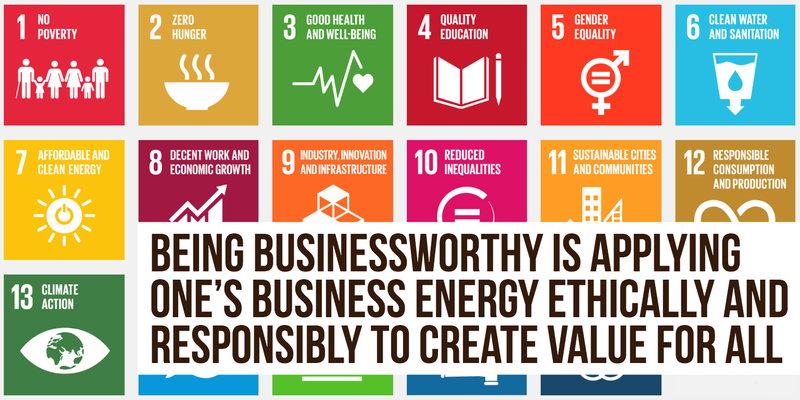 To be businessworthy is to apply one’s business energy ethically and responsibly with the purpose of creating social as well as economic value. Being a role model to society and peers: A businessworthy leader acts as a role model to the general public and the business community by showing how to achieve long term success by focusing on societal benefit. Having earned trust by stakeholders: another measure of being businessworthy is having earned recognition and appreciation as a business leader by stakeholders in the communities within which the business is developed and cultivated over time. Standing out as an advocate: Businessworthy leaders are outspoken advocates for the importance of ethical and responsible business, seeking to solve problems that create value for both business and society. Read more about the concept of being businessworthy in a paper by Business for Peace Founder, Per L. Saxegaard: Rebuilding the trust-proposition between companies and society through Being Businessworthy.